A bed can be a breeding ground for dust mites, a microscopic look has shown what could be breeding in your bed every night. Millions of tiny mites can reside in the average bed and are about a 1/4 of a millimeter long and are known to cause allergies in many people. Mites are surrounded by their own feces, and on average they can produce about 20 droppings per day. Mites tend to live off human skin scales, which are partially digested by moulds, and tend to thrive in humid, warm or damp environments. Our mattresses, pillows, duvets and carpets (which are the most common areas) accumulate human skin cells, therefore dust mites commonly multiply in these places. In as little as 2 years, approximately 10 per cent of a pillow’s weight will be made up of dust mites and dust mite droppings. An average sized Human can shed about half an ounce of skin a week, and a lot of that will reside in a bed. 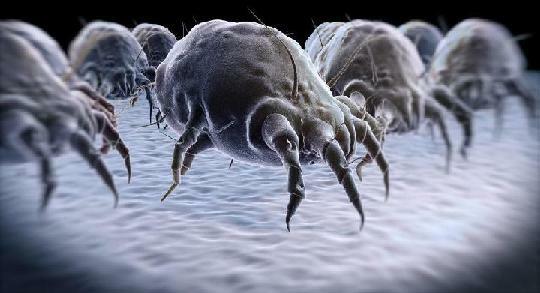 Dust mites love warm moist environments and a bed is the perfect place for them to breed. They can reproduce as many as 10 million per bed in a lifetime. So creating an appealing environment for these microscopic crawlers is common. Often people are away from home during daytime hours so they shut their windows. This can cause moisture to stay trapped in the room. While these little creatures themselves are relatively harmless, their body fragments and feces can trigger allergic reactions which can prompt the body to release histamines to attack the allergen, and can cause eczema and hay fever, and estimates suggest dust mites may be a factor in asthma for up to 80 per cent of people who have it, as they can cause a cough, rhinitis, dry eyes. They can disturb sleep. People with other allergies can be worse off. So if you think dust mites might be triggering your allergies, you may want to consider buying a new mattress from the Sealy Mattress Sale Toronto. Many people who think they just have seasonal allergies or a cold, might have dust mites causing their symptoms instead.